What is value? And what’s the purpose of economic activity? Recent books by Mariana Mazzucato and Kate Raworth have put these fundamental questions in the spotlight. A cynic, Oscar Wilde wrote, is someone ‘who knows the price of everything and the value of nothing.’ In her latest book, The Value of Everything: Making and Taking in the Global Economy, Mariana Mazzucato argues that, by this definition, we have all unwittingly become cynics. For centuries, economists debated different theories of value. Some saw it as intrinsic to commodities like gold and silver. Others argued it was determined by the quantity of labour required to produce a good. Secondly, it is philosophically inadequate: the implication of “value-equals-price” thinking is that anything you give or receive for free is valueless. This means that things like nature, community, culture and friendship — things which are not easy to monetise without undermining the intrinsic value of the good in question — are excluded from discussions of economic value. And yet these are not peripheral “externalities”: they are the very essence of what sustains us and makes life worth living. This inability to discern value creation from value extraction makes life very difficult for anyone looking to foster long-term growth. How are policy-makers and business leaders meant to decide how to allocate resources if they can’t tell which activities actually create value and which don’t? Mazzucato’s book is stronger on diagnosing the problem than prescribing solutions. She argues that companies should pursue ‘stakeholder value’ as opposed to ‘shareholder value’, but does not really scratch the surface in terms of what this means. She does devote a chapter to the concept of ‘public value’ — a term missing from most economists’ lexicon. But this is largely a rehash of her previous book, The Entrepreneurial State, in which she argued that, far from being a leech on the economy, the state is a vital source of innovation and growth. Famously, she showed how practically every technology that makes an iPhone smart traces its origins to government-funded R&D. In The Value of Everything, Mazzucato exposes instances of value extraction masquerading as value creation in the financial, pharmaceutical and technology industries. This is territory that others have covered before, but that doesn’t make her critique any less devastating. Finance is first in the firing line. Until the 1970s, net interest payments, one of the principal sources of banks’ profits, were excluded from output in national accounts. Finance was seen as being about transferring existing value — a necessary activity, but not a value-creating one in its own right. Then, thanks in no small part to financial industry lobbying, this changed. Today, the size of the financial sector relative to the whole economy is seen as an indication of how much value it creates. But this is exactly the wrong way round. If the financial sector truly were creating (or at least facilitating the creation of) more value than it extracts, then finance’s share of GDP should go down, not up. Growth in the rest of the economy should outpace finance, as other industries benefit from its “risk-taking” and “financial intermediation” services. Next, Mazzucato takes the pharmaceutical industry to task for its use of “value-based pricing”. Because their products save lives, mitigate pain and suffering, improve quality of life and, in theory, reduce overall healthcare costs, pharma executives claim they are justified in charging prices that are completely out of line with production costs and R&D expenses. Monopoly power is at the heart of Mazzucato’s critique of the tech industry, too. Network effects and first-mover advantage have combined to give companies like Alphabet, Amazon and Facebook enormous power to extract value. The mountains of data those same companies now own will — unless the current model of data ownership is successfully challenged by politicians and regulators — enable them to go on extracting monopoly rents for the foreseeable future. So where does this leave us in terms of defining value? 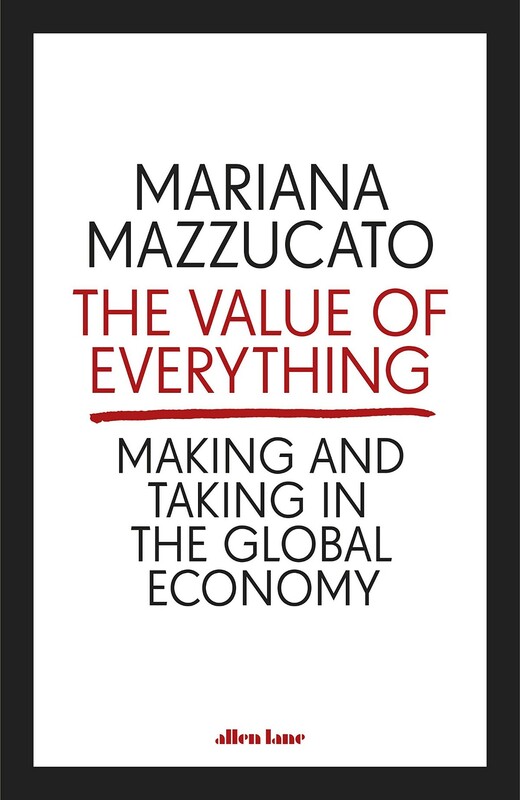 Ultimately, Mazzucato argues, ‘the definition of value is always as much about politics, and about particular views on how society ought to be constructed, as it is about narrowly defined economics.’ In short, it’s impossible to answer the question “what is value?” without first answering another even more fundamental one: what sort of economy do we want? This is where Kate Raworth — author of Doughnut Economics: Seven Ways to Think Like a 21st-Century Economist — picks up the story. ‘The goal of the 21st-century economy,’ she argues, ‘should be to meet the needs of all within the means of the planet.’ That means abandoning our obsession with GDP growth and focusing instead on a wider set of indicators that incorporate environmental and social outcomes. Raworth portrays economic success as a circular band — ‘the safe and just space for humanity’. The lower limit of this space is defined as the fulfilment of basic human needs and rights, such as health, education and shelter. The upper limit is determined by planetary boundaries. Raworth’s approach chimes with the concept of ‘system value’ developed by the Future-Fit Foundation. The underlying premise is the same: the economy is nested within — and reliant upon — society and the environment; impacts on people and planet are not externalities — they are the essence of what it means to create, or destroy, value. Marginal utility theory purists will object that system value and Doughnut Economics are normative rather than descriptive: currently we live in a world where companies can externalise social and environmental impacts. But, pace Mazzucato, this is a political choice, not an immutable economic fact. Economics is a tool to build the future we want, not a science to describe the reality we endure. There’s still a long way to go, but it’s not too hard to see the stirrings of a paradigm shift here. More than a century on from the intellectual revolution that made “value-equals-price” thinking mainstream, an inversion of that particular paradigm is long overdue. To develop a political agenda that focuses on ensuring that regulations and taxes incentivise system value creation. Project Breakthrough Lead @ Volans. Fascinated by the future of business, sustainability, politics and history.